Strategies for Quasi-Monte Carlo builds a framework to design and analyze strategies for randomized quasi-Monte Carlo (RQMC). One key to efficient simulation using RQMC is to structure problems to reveal a small set of important variables, their number being the effective dimension, while the other variables collectively are relatively insignificant. Another is smoothing. The book provides many illustrations of both keys, in particular for problems involving Poisson processes or Gaussian processes. RQMC beats grids by a huge margin. With low effective dimension, RQMC is an order-of-magnitude more efficient than standard Monte Carlo. With, in addition, certain smoothness - perhaps induced - RQMC is an order-of-magnitude more efficient than deterministic QMC. Unlike the latter, RQMC permits error estimation via the central limit theorem. For random-dimensional problems, such as occur with discrete-event simulation, RQMC gets judiciously combined with standard Monte Carlo to keep memory requirements bounded. 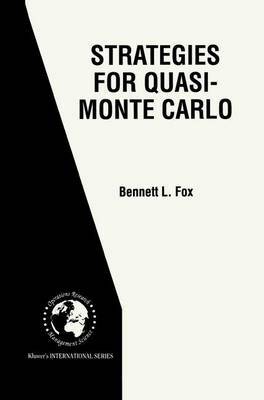 This monograph has been designed to appeal to a diverse audience, including those with applications in queueing, operations research, computational finance, mathematical programming, partial differential equations (both deterministic and stochastic), and particle transport, as well as to probabilists and statisticians wanting to know how to apply effectively a powerful tool, and to those interested in numerical integration or optimization in their own right. It recognizes that the heart of practical application is algorithms, so pseudocodes appear throughout the book. While not primarily a textbook, it is suitable as a supplementary text for certain graduate courses. As a reference, it belongs on the shelf of everyone with a serious interest in improving simulation efficiency. Moreover, it will be a valuable reference to all those individuals interested in improving simulation efficiency with more than incremental increases.